Time for another belated status update! 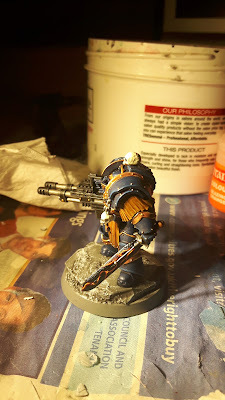 These photos were taken a while ago before I got distracted from my Night Lords (and 40k in general) by my Infinity Nomads. So, I got the Betrayal at Calth box for Christmas (wow, that's a long time ago now!) and, unsurprisingly, started making up the minis as an addition to my Heresy Night Lords force. After drooling over the models and building most of them in a frenzied rush, I turned to painting. 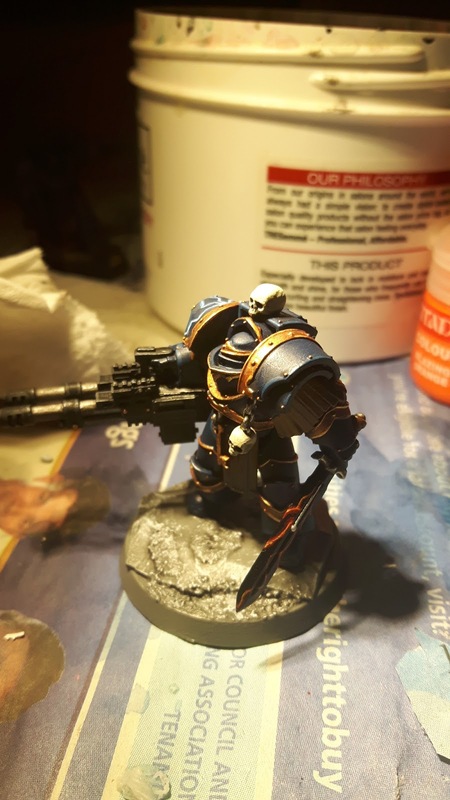 To begin with, I started painting my tactical marines, bringing them up to a full ten man squad. My next plan was to convert and start painting a squad of assault marines but suddenly, I had an epiphany. I had never painted a model in Terminator armour. It's worth letting that sink in for a second (or at least it was for me). I like to think of myself as a fairly experienced hobbyist. I have four sizeable armies and have been playing for years across multiple editions of 40k. I've painted infantry, monstrous creatures, vehicles (ok, not many, but vehicles are hard!) and flyers but never once a model in terminator armour. Needless to say I resolved to change this immediately and have a full squad of Night Lords Cataphractii painted up as soon as possible. The pictures here (apologies for lighting) show the first completed member of the squad. The reaper autocannon was made from two Anvil Industry autocannons glued back to back. I think it gives a nice Heresy feel to the model and is very reasonably priced! 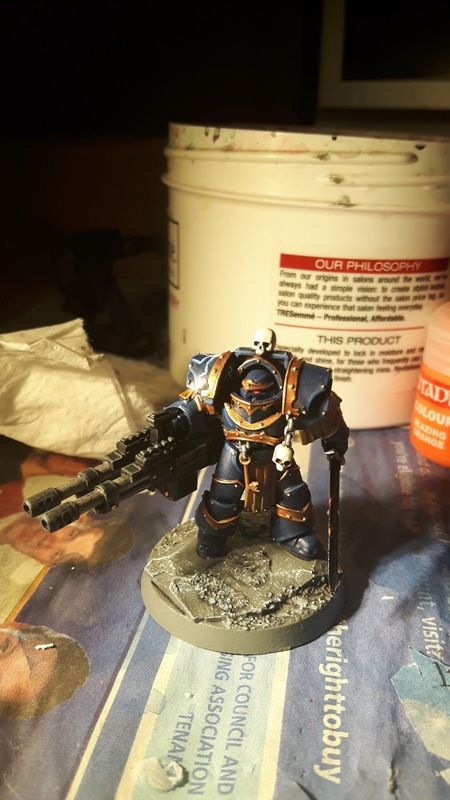 The rest of the model is the basic Terminator kit with a couple of skulls added for a Night Lords feel. I'm very pleased with the overall result. Power Sword - Keeping the model cost down! Yes, that is Tresemme in the background - keeps my brushes silky smooth! I have since completed two more members of the squad including the Sergeant. More pics to come soon! I prefer to coat my terminators in L'Oréal .....because they're worth it. Can't remember the last time you painted a Terminator. Probably about 2 years. I think it was my heresy style chaos Lord with lightning claws. Well unless you count Mega armour. Hi Ed - loving the effect you'd added to the Power Sword. Any chance of sharing your process for painting it? Thanks in advance! Sure thing Nick, I'll put up a tutorial at some point this week. Keep your eyes peeled!